The GoPro HERO7 Silver is the perfect camera for adventures big and small. It’s built tough and totally waterproof so you can capture and share experiences that you can’t with your phone. 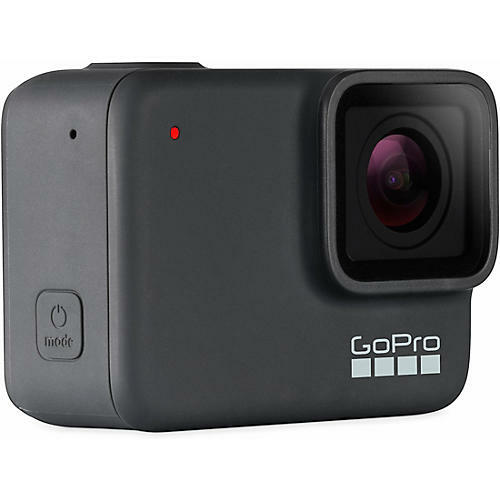 Get stunning 4K video that’s as amazing as the moment itself and track how fast, high and far you went with GPS location stickers. You can also shoot time-lapse videos to turn longer events into short, shareable moments. With an intuitive touchscreen and simple, streamlined capture modes, it’s easy to jump right in and get great shots. Just swipe and tap. You can also control your HERO7 Silver hands-free with voice commands like “GoPro, take a photo” and “GoPro, start recording.” HERO7 Silver takes beautiful, vibrant 10MP photos—even in challenging shots that mix bright light and shadows. And with Burst mode, you can take 15 photos in one second. HERO7 Silver also records smooth, steady video whether you’re skiing, snorkeling or chasing your dog around the yard. Capture photos and videos in portrait orientation—so they're perfect for your Snapchat and Instagram Stories—and record 15 or 30-second video clips that are just the right length for sharing on all your social media. With a built-in photo timer, it's easy to grab a GoPro selfie or group shot with your whole crew in the frame. HERO7 Silver also has an advanced slo-mo feature so you can slow things down to relive the funny, interesting or epic moments in all their glory. With HERO7 Silver, your photos and videos can sync right to the GoPro app where you can transform them into fun, shareable content with music and effects to then post, text, Tweet or Snapchat them out to the world. Also, with over 30 compatible accessories, you’ll get unique perspectives and capture your life in a new, creative way.